Description Calculate lithology and fluid probabilities and perform classification using statistical rock physics models. The LithoFluid Probability process uses Bayesian prediction to calculate probabilities and perform classification using statistical rock physics models. Two volumes are required with content matching the data in the statistical model (e.g. Acoustic Impedance and Vp/Vs, mu*Rho and lambda*Rho). The process can be configured to generate a single "maximum likelihood" classification volume, or multiple probability volumes (one for each of the lithofluid combinations). 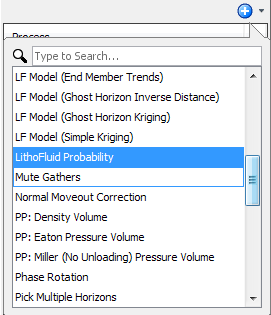 Each Lithofluid Probability process can also be used in Predict to calculate probabilities and classify well curves, providing valuable QC and calibration. In the Details Panel, select a Litho-Fluid Model from the searchable drop down list. At PDF Interpolation, choose the interpolation method used to interpolate the rock physics PDFs to the volume sampling. Interpolate PDFs — Insight will interpolate between the available points to smoothly map to the volume sampling. Use Nearest — With finely sampled PDFs, you can choose to explicitly use the nearest ellipse set at each depth. Select a prior model at Priors (see Create a Prior Model). At Water Bottom, select whether to use a Constant or a Horizon to define the water bottom. If a horizon is chosen, you can optionally input a constant value in the adjacent box to offset the horizon. 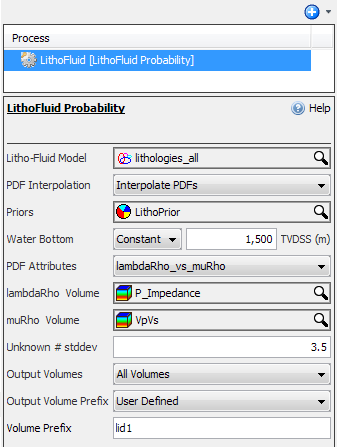 Select the PDF attributes to analyse from the litho-fluid model at PDF Attributes, and assign a volume to those attributes. Available attributes are based on the PDF model selected (AI vs Vp/Vs, AI vs SI or muRho vs lambdaRho). At Unknown # stddev, specify the range from the nearest PDF beyond which a point may become Unknown. For example, if the ellipses display 2 standard deviations, and the Unknown # stddev is set as 2, points outside the ellipses will become unknown. We recommend using at least 3 std dev for unknown, so the modelled PDFs will capture almost 100% of the observed data. 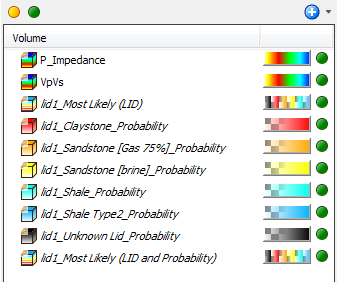 At Output Volumes, choose whether to generate the Most Likely (LID), Most Likely (LID and Probability), or All Volumes. Give the output volumes its own prefix by selecting User Defined at Output Volume Prefix and typing a prefix below, or click Process Name to allow Insight to name the volumes using the name of the process. As a result of this process, new volumes of probabilities will be added in the Volume tab for each litho-fluid.